Saluting Davia Temin and Manhattan-based Temin and Company, forging thought leadership into a titanium-strong marketing tool, since 1997. 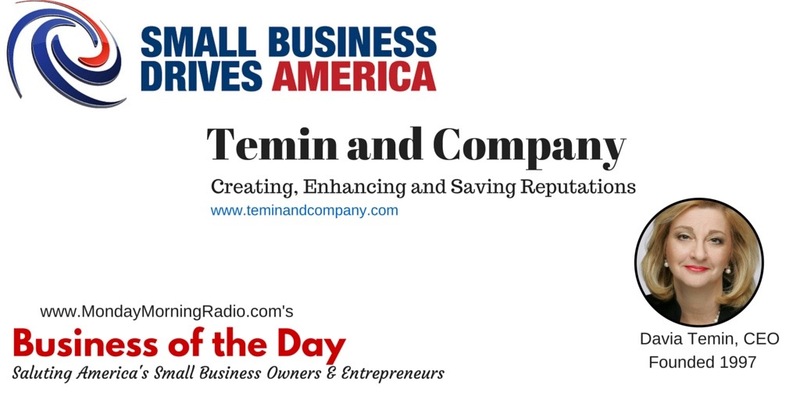 Temin and Company is a boutique management consultancy focused on reputation and crisis management; marketing and media strategy and implementation; marketing through ideas, information, expertise and intellectual capital; and leadership and communications coaching at the highest levels. Hear Davia exchange ideas and recommendations with Monday Morning Radio host and reputation coach Dean Rotbart at http://tinyurl.com/mmr032215.